CERRITOS, CA--(Marketwired - Dec 16, 2015) - Millennium Dental Technologies, Inc. announced today that it has filed a new patent application on innovations in its LAPIP™ protocol and PerioLase® MVP-7™ dental laser. This initiative is part of its ongoing commitment to the fight against gum disease around teeth and implants through state-of-the-art technologies and patient-friendly protocols. 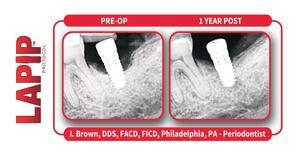 "The LAPIP™ protocol is a ground-breaking clinical procedure for treatment of peri-mucositis and peri-implantitis around titanium implants," said Robert Gregg, DDS, founder of Millennium Dental Technologies and innovator of the LAPIP™ protocol. Dental implants were seen originally as a long-term replacement for teeth, and millions are placed annually. With current dental implant failure rates over 16 percent and rising, patients are being subjected to highly invasive surgeries in an attempt to save these ailing and failing implants. The LAPIP™ protocol is a tissue-sparing, non-destructive, minimally invasive treatment with proven results. "Our new patent application protects years of research in perfecting the LAPIP™ protocol. This patent application is for a comprehensive patent covering not only the LAPIP™ protocol itself, but also covering innovations in the PerioLase® MVP-7™ dental laser that make the LAPIP™ protocol possible. There are omnibus claims to both," states Dr. Gregg. Dr. Gregg also outlined plans for filing further patent applications to protect innovations in Millennium Dental Technologies' LANAP® protocol. "The LANAP® protocol is foundational to laser-assisted periodontology, and our innovations in this technique and other laser-assisted protocols, will soon be the subject of major new patent application filings," said Dr. Gregg. ABOUT MILLENNIUM DENTAL TECHNOLOGIES, INC.: Headquartered in Cerritos, Calif., Millennium Dental Technologies, Inc., is the developer of the LANAP® protocol for the treatment of gum disease and the manufacturer of the PerioLase® MVP-7™ digital dental laser. By providing a simple and comfortable experience with unique bone-building clinical results, MDT's FDA-cleared and patented LANAP® protocol removes the fear from gum disease treatment, offering a vastly less painful and less invasive regenerative treatment alternative to conventional scalpel/suture flap surgery; its PerioLase® MVP-7™ is a 6-watt free-running variable-pulsed Nd:YAG dental laser featuring digital technology and 7 pulse durations -- the most available on the market -- giving it the power and versatility to perform a wide range of soft- and hard-tissue laser procedures. The PerioLase® MVP-7™ is also developed for the LAPIP™ protocol, for the treatment of ailing and failing implants. Established in 1994, the company's founding clinician, Robert H. Gregg, II, continues to operate the company with the vision: To create better clinical outcomes in periodontal disease patients -- and to remain true to the guiding principle -- "It's all about the patient." For more information, visit www.lanap.com.